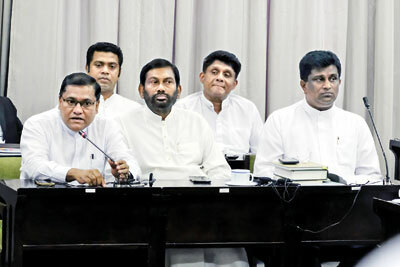 Leaders of the United National Party, the Tamil National Alliance, the Janatha Vimukthi Peramuna and the Sri Lanka Muslim Congress met Parliamentary Speaker Karu Jayasuriya on Friday to express concern over the delay in resuming Parliament sessions. Seen here is JVP’s Vijitha Herath addressing the meeting amidst UNP and JVP MPs. The JVP has said it will neither support Mahinda Rajapaksa nor Ranil Wickremesinghe.